Get ready. Here comes the best bath time activity ever. I’m not trying to oversell here, friends, but seriously. This was one heck of an amazing bath time activity. The kind that will go down in the easy toddler activity record books, which I’m sure is around here somewhere. Grab your bag of pom pom balls. It’s about to get real awesome. Oh and stick around for some tips on how to clean-up this crazy easy activity. Duh. You only need one supply. 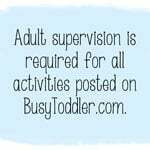 Nothing is better than a super easy toddler activity and I’m not going to lie: I definitely rank activities based on how many supplies I needed to make it happen. Well good news. 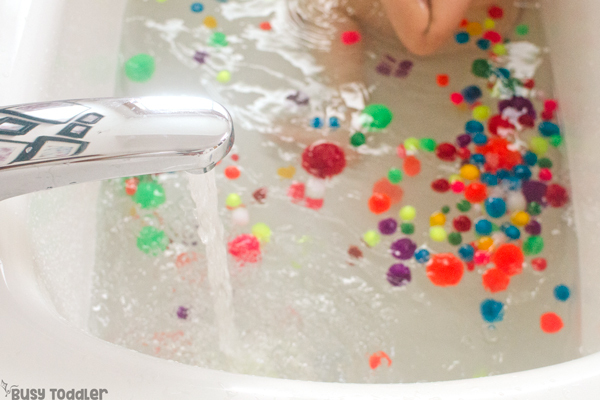 You only need one supply to make this bath time activity happen. That’s all you need. Oh, I guess pom pom balls AND a bath tub. Ok fine – there are two supplies. Three, if you include water but I think that’s getting nit picky (insert cry laugh emoji). I tossed my two year old bag of pom pom balls into the tub with my two year old and she went nuts! Why wouldn’t she? This was so inviting, so awesome, and so unexpected! I also added in some kitchen utensils and bowls for a little more pom pom fun. Pom pom balls are seriously the best. They don’t get old. Easy to set up, but how do you clean up? 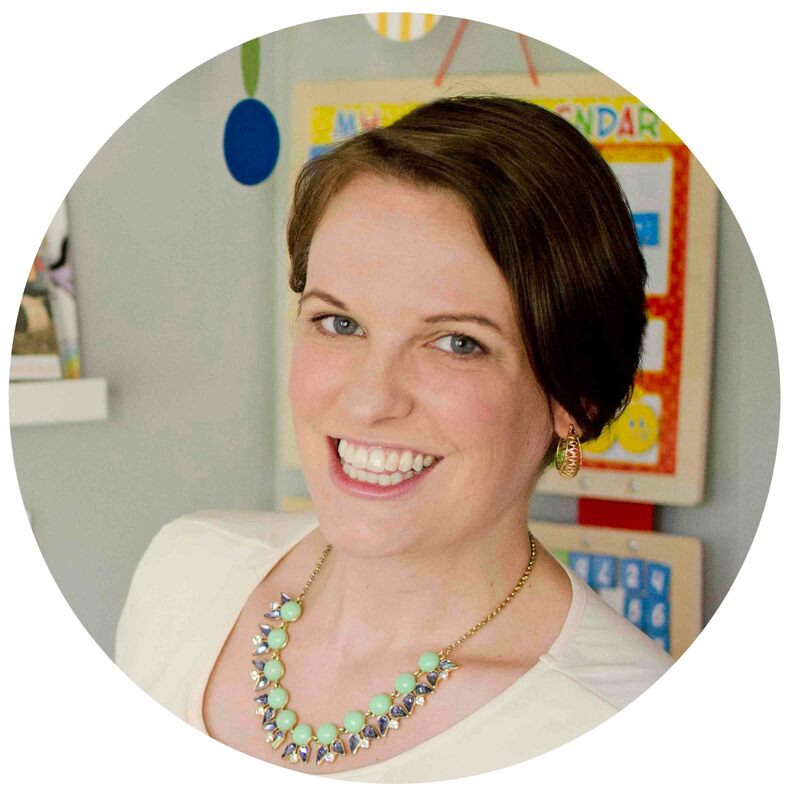 I had NO idea you could get pom pom balls wet until my friend from Happy Toddler Playtime told me (she had this great pom pom scoop activity with water and I was like – hold the wet pom pom ball phone!). Turns out, pom pom balls can get wet and they’re dry just fine! To get them out of my tub, I used a colander because I was a tad worried some small wet pom poms might make it down my drain. Then, I set them on a towel and folded the towel in half. I pushed and smooshed those wet pom pom balls to ring them out in the towel. They were pretty dry right away. I laid them to dry fully on a new clean towel in one layer and viola. They were actually so much cleaner than before the bath. This bath time activity was AMAZING. 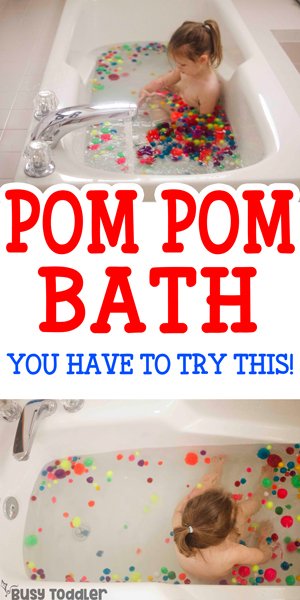 I’ve always been big into bath activities and pom pom ball activities so it was high time I put the two together. And what a marriage it is! 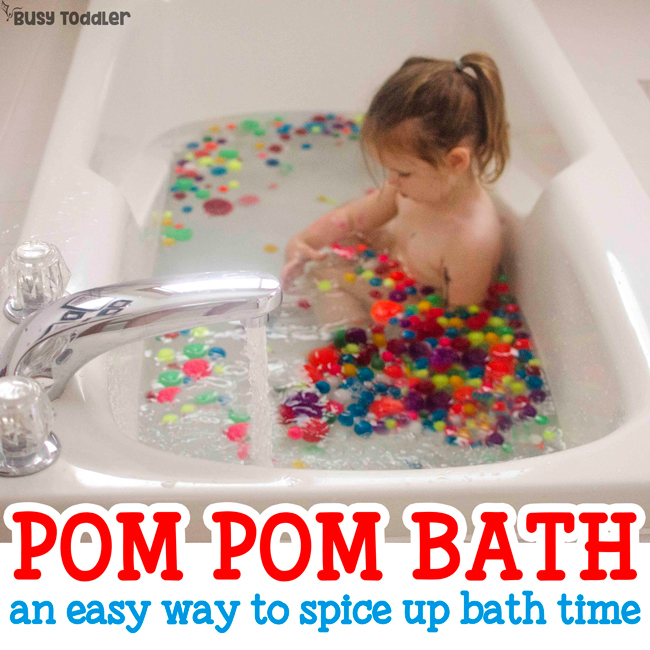 Pom pom bath will go down as one of our favorite toddler activities ever – it’s just so simple, so easy, and so much fun. 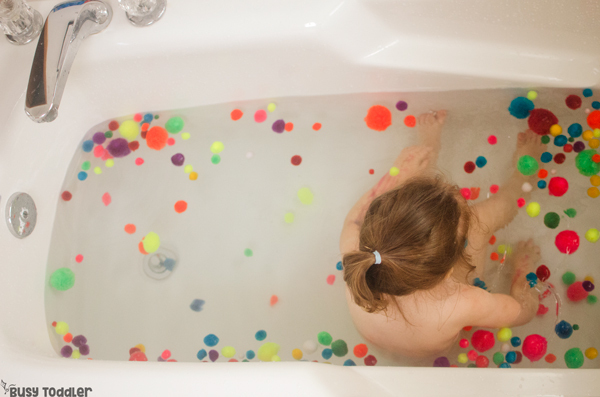 Will you try this bath time activity at your house?